I googled my old art teacher, found he died a few years ago. There was an exhibition of his collected paintings called 'A Lost Landscape'. Paintings of the life and landscape around him, mills. terraced houses, mill workers, miners of lancashire in the 1950s-60s. I tried to find more information about the people, the history he was painting as it melted away before his eyes. Talk about 'mists of time'. In some ways, there are better records and archives for the 1800s than of Lancashire in the 1900s. We may wonder about ancient civilisations, and think our life and history today is better documented, but the reality is, the mists of time swallow up everything quicker that you think. 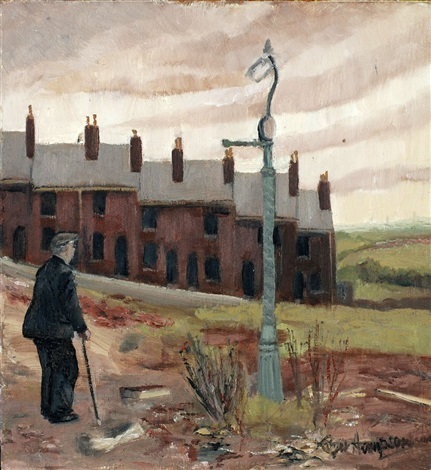 The row of slanted terraced 2 up 2 down and the old metal gas lamp standard set against the Pennine hills in the background serves well for the memories - Old Lumbutts as a boy - not unknown to me. Roger Hampson strikes a bell. Where did he teach? I met Roger Hampson when he taught at Bolton, he went on to Loughborough. I think he was aware that the social and physical landscape around him, that seemed so solid was disappearing. A lot changed quickly in Lancashire in the 1960s and 70s. Remnants of medieval thee and thou culture moving into the space age, before the digital age, before computers and digital cameras to record it. Mills and housing demolished, communities dissapearing, a changing landcape not recorded very well, fragmentary and unregarded. Administrative borders and arrangements changing, paper records too bulky to store, new roads cutting through towns, a complicated mix. As the people get old, information is lost and gone. Where was that mill? Somewhere round here, who owned it, Maybe that chap, who worked there, dunno. Great chunks of the past melted away like ice in warm water. The mists of time. Indeed. That painting looks very much like the mill on Queensway as you come off the dual carriageway going towards Castleton. But of course it is the same almost as so many others of the period many of which appear in one way or another in my Ower Darkling series. There is quite a lot of 19th/20thc stuff about, try Touchstones in town for archives, but it's knowing where to find it. Sorry, but the page you were looking for either does not exist anymore or has been moved from this location. Considering writing was invented thousands of years ago, much history since then has been lost. Whether more information will survive into the future is questionable, we have massive data storage now, but, time has it's ways of erasing everything. Finding local histories is surprisingly difficult, records often fragmentary, informal and scattered. It's a time consuming job for specialist researchers to gather and make sense of it. As one of the most organised countries, you might expect British history to be well documented, some is, but paper records, especially of ordinary people tend to get lost one way or the other. Taking a walk down memory lane, you may hear the noise of something behind the hedge, eating up and destroying the past, it's the time monster. Even on the history of kings and queens, historians are always re-interpreting the past, much of history is a matter of conjecture. How many millions of people lived on earth in the 20th century, and how much is known about them? Surprisingly little, not even their names. Still, we should have a massive supply of 'selfies' stored up in the cloud for the 21st century. Even with good information, seeing the past as it really was is almost impossible. Would people in the future watching 'reality television' or news reports of today get much idea? Memory, eye witness acounts are notoriously fallible. The best historians can do is to string together 'facts' and create a narrative. Much of the video people in the future may have available will be fictional or biased one way or the other, but some of it will be useful. People will be able to see extinct animals, elephants, rhinos, giraffes as they were in the wild. Who has time for history though? Dealing with today is enough for most people. Some of the decisions our politicians make seem to be made without much awareness of history. My childhood impression of Lancashire in the 1950's and 60s was of a complicated but ordered society. Looking back and seeing how unrecorded much of it is, it looks more like it was something of a 'make it up as you go along' patch of history. A mix of order and disorder. Much as it is today perhaps? The order of the past came from the chaos of war and the need for a better life. Society fused the order of that day from community and the needs of that community. What little that was available was spread across the community to enable the most 'needy' to survive. When community went then also went cohesion as the welfare state took over the role as the means to 'need'. You will remember 'means testing' as the most fair method to distribute what was available - that has gone out of the door as the liberal minded declared it degrading and replaced it with the 'universal' benefits we have today. History cannot explain to in's and out's of the minutia without going to great lengths and people don't have the patience to 'want' to know. Therefore you will only get a snap-shot of the 'past' and little of what it was about and how it came to be. That's people -. Underlying reasons that make things the way they are can be difficult to fathom. The effects of both world wars had huge and permanent effects. Manchester and Liverpool were separate civilisations. Still are to an extent. The smaller towns of the north-west, with their separate and distinct characters and histories, were caught up in those post-war changes, a complicated mish-mash of events and changes in the 1960s. The last of rural, agricultural Lancashire disappeared from view, great motorways and huge chemical works sprouted up, television took over, boundaries changed, quite a seething mass of information for any historian to get in focus. To get a 'real' feel of the times one must delve into the historical novelist (Dickens etc) who used the 'every day' workings of the time to elaborate on descriptions of 'time and place' for the story-lines of their works. Careful reading often pulls out the minutia to enable one to visualise the 'truth' of the times. But who does these days? Books - why would i read a book when I have the whole of the t'internet to go at -. I would argue that the 't'internet' is merely a series of very short stories that give the gist but not the meat. Therefore one ends up with a 'little' knowledge - and we all know where that leads. Dickens was a 'visual' writer, readers tend to see the scenes he describes in their mind as pictures. Whether he did that conciously or just had the knack I don't know. He was involved with theatre I think? In the news is the Turkish prime minister accusing Germany and Holland of acting like Nazis. Echoes of the Nazi era in Germany still effects how people think. The immediate UK post-war generation were generally sheltered from the details as children, but found out about it as teenagers. I remember me and my contemporaries being quite traumatised by books and films about the death camps, the scale of it, the distance too close in time and geography. Everything had seemed reasonably hunky-dory until that information landed. I wonder how much that affected the way people thought in the 1960s. Also in the news, and related, reports of masses of Syrian children suffering post traumatic mental health problems, which isn't surprising. Altogether, it's apparent wars effect how people think for many decades afterwards. With Dickens I suspect intentional. He was a great crusader against poverty and child abuse. His books I suspect was his way of flaunting the ills of the times in the faces of the wealthy and rich class and saying; Ignore it all if you can. Just don't pretend you are ignorant of the facts. And of course in the process we of today get a richer more balanced view of those times. Turkey - oh dear me -. The bridge to Asia and the breastworks of the West -. Turkey holds the key to the European's future. One of the reasons she was 'brought' into NATO in the 1960's. Today she is the bulwark against Islamic fundamentalism and mass migrant invasion. Unfortunately these past few years has seen an erosion of secular values in that country and the creeping insidious tentacles of Islam reaching ever forward. The present President Erdogan has decided the road towards Islam is his best route towards survival and of course as the Turkish referendum looms he wants the support of the Turks from across Europe to ensure a solid mandate and his governments survival. Holland stands in his way as regards Islamic influences and is slowly turning towards fascism as regards its immigrant population - and so - - - - - BANG. It will all quieten down after the two elections are over and Erdogan can go back to fannying up to the Russians. Yes, elections seem to be the catalyst for the hoo-ha. Turkey does seem to look for ways to exploit european weaknesses to it's own advantage. That's politics as we know it. Back to Lancashire of the 1960s, where waves of modernity met a complicated scattering of different local cultures. All sorts of things happening, the generation gap opening up, employment patterns disintegrating, industrial wastelands just starting to green over, media starting to make it's mark, lots of individual stories, ideas and attitudes. Put it all together and it's a mass of not very well known or recorded social history. Well I did my best with my four autobiographies to at the very least describe some of the conditions prevalent at the time and I did add some historical context by way of news items of the period. One cannot do more. If people chose not to read them or other books and items in the archives, as at Touchstones etc, there is nothing else one can do. I realised many moons ago I could not save the world or even a tiny corner of Rochdale - - .